Galia Solomonoff is the founder and creative director of Solomonoff Architecture Studio (SAS). She received her Master of Architecture degree from Columbia University, where she was awarded the McKim Prize for Excellence in Design and the William Kinne Fellows Traveling Prize, and her B.A. from City College, where she was named Best Student of the School of Architecture in 1990. 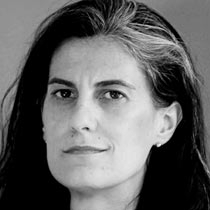 Prior to founding SAS, Solomonoff worked with OMA/Rem Koolhaas, Rafael Viñoly, and Bernard Tschumi Architects, as well as OpenOffice, which she co-founded. She has taught at the Rhode Island School of Design; Princeton University; The Cooper Union; Yale University; and Columbia University’s Graduate School of Architecture, Planning and Preservation, where she is currently Associate Professor. Solomonoff is the recipient of two AIA Design Awards, grants from the New York Foundation for the Arts and the National Endowment for the Arts, and recognition in the Architectural League of New York’s Emerging Voices series. New York magazine called Dia:Beacon (2003), which Solomonoff designed with OpenOffice, “one of today’s most compelling new buildings,” and named Solomonoff part of the Next Wave of Designers. Her work—which ranges in scale from apartments to townhouses to large museum projects—has appeared in the New York Times, The New Yorker, W, ARTNews, Artforum, and Domus. Solomonoff’s projects have been included in the books Trespassing: Houses x Artists, Allison Arieff’s Prefab, and the Vitra Design Museum’s Living in Motion, and her writing on topics related to contemporary art, culture, architecture, and urbanism has appeared in Post-Ductility: Metals in Architecture and Engineering, Layered Urbanisms, Perspecta, Latin American Architecture: Six Voices, and From Carnal to Virtual. Solomonoff grew up in Rosario, Argentina and now lives in Manhattan.